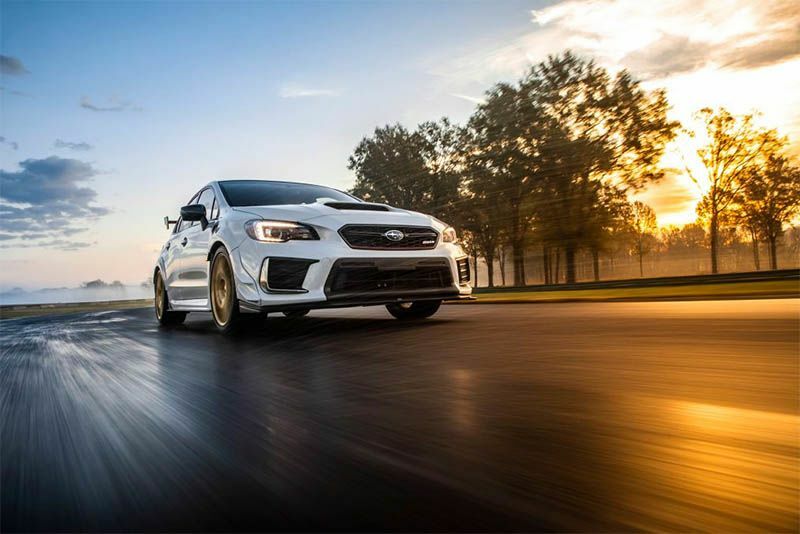 Subaru has released their latest WRX STI, dubbed the S209, at the Detroit Motor Show – but it’s only going to America. This is the limited edition Subaru WRX STI S209, one of the most powerful ever released by the Japanese manufacturer, and it appears to be the best yet. If you're in America, that is. For the first time, Subaru is selling an S-Line model outside of Japan and, inspired by Subaru’s WRX STI Nurburgring Challenge race car, it's jam-packed with bespoke performance parts and all-new tuning elements. In another first, the S209 will be assembled at Subaru Tecnica International’s facility in Kiryu, Japan. Which, along with its limited run of just 200 cars, will make this special a highly sort-after vehicle indeed. So, what are these bespoke performance parts? I hear you ask. Well, out goes the screaming EJ20 engine fitted in all previous JDM S-line models, and in goes the 2.5-litre EJ25 flat-four, modified to pump out an estimated 336bhp – that's 31bhp more than the current STI in the States. According to Subaru, a simple ECU remap was insufficient and that there was a considerable amount of work that went into achieving these numbers. Instead, the STI has received new forged pistons and connecting rods, while the intake has been redesigned, there are larger injectors and a more effective fuel pump too to get extra air and fuel into the cylinders. The turbo, designed and manufactured specifically for the S209 by HKS, is running at 18psi boost, up from the current 16.2psi. It has an eight per cent larger turbine and six per cent larger compressor too while a water-spray system, controlled via a paddle behind the steering wheel, helps cool the larger intercooler. A short-throw six-speed manual gearbox gets the power from the engine to Subaru’s legendary all-wheel-drive system that uses 15mm wider front and rear axles. Depending on the driver mode selected, a combination of power torque vectoring, the electronically controlled locking differentials and active centre differential split torque between the wheels depending on which one has the most traction. To deal with the extra power, Subaru has installed six-piston front and two-piston rear calliper Brembo brakes and upgraded high-friction performance pads. The S209 rolls on gold 9-inch forged BBS alloy wheels shod with Dunlop SportMaxx track-day tyres. There's more magic, supplied by Subaru’s motorsport division, in the form of stiffening beam cross members fitted underneath and a pillow-joint strut bar across the front axle. Apparently, this setup is "longitudinally flexible but completely stiff laterally to improve the minute front suspension geometry without compromising suppleness". There are bespoke Bilstein dampers and stiffer springs too which rounds of this thoroughly reworked limited edition Subaru STI. In terms of aesthetics, the S209 has 48mm widened arch extensions, a stacked rear wing and front-mounted canards that combine to give it a rather aggressive look. The interior has bespoke trim with the regular complement of features. All-in-all, this special edition Subaru WRX STI S209 sounds like it means business. It may be the last of a dying breed in terms of powertrain but, as Subaru gains market share in countries like the US and Australia, the next STI might surprise with hybrid-power... Onward and upward, Subaru.